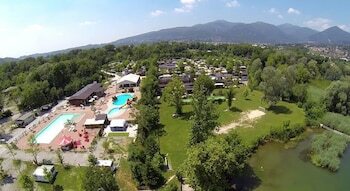 With a stay at Holiday chalets Camping Class in Eupilio, you'll be within a 15-minute drive of Segrino Lake and Mount Cornizzolo Aero Club. The front desk is staffed during limited hours. Free self parking is available onsite. With a stay at Island Lagoon - Venezia in Venice (Venezia-Murano-Burano), you'll be within the vicinity of Palazzo Giustinian and St. Mark's Basilica. With a stay at Appartamenti Adriana in Sirmione, you'll be a 4-minute walk from Scaliger Castle and 9 minutes by foot from Grotto of Catullus. A stay at Bmode places you in the heart of Catania, steps from Massimo Bellini Theater and Palazzo Biscari. Self parking (subject to charges) is available onsite.